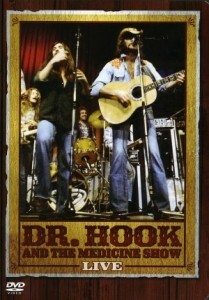 Well, it all started with this long form article, “We Never Have to Be Alone”, by Will Sheff that describes (in lengthy detail) a performance by Dr Hook that was taped by a German TV station in 1974. (Besides being a fine writer, Sheff is also a member of the Alt Country band Okkervil River.) Sheff makes a passionate argument that Dr. Hook and the Medicine Show, Live 1974 is the best concert film ever recorded. Ever! My cousins had a copy of the DVD I was able to view it before reading the article. I have to admit, it is something to behold. What you see is a band that clearly has the talent to put on a great performance, but a whole lot happens in the brief 9 song, 45 minute show. Songs start and stop, guitars go out of tune, band members get pissed off at one another, and one guy even pukes on camera. But amidst all this mayhem is a performance by a band that has self-deprecating charm, wit and, at least for certain moments, flashes of brilliance. They play like they’ve got nothing to lose and it is a delight to watch. But you have to read the Sheff article (all of it) and try to get your hands on a copy of the DVD so you can view the whole thing at once. You will not be disappointed. This entry was posted in song of the week, tom and tagged Dr Hook and the Medicine Show, Marie Laveaux, song of the week. Bookmark the permalink.